ApiProtect, a new type of Asian hornet trap, has been launched by Vita Bee Health to protect honey bees when they are under sustained attack. ApiProtect is effective, non-toxic and economical. It has been tested widely in France to prove its effectiveness, and when used as instructed traps few or no non-target creatures. It is designed for conditions where the Asian hornet has become established and imposes existential threats to honey bee colonies. 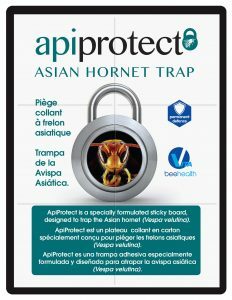 ApiProtect is easy to install and use. Late in the season when an Asian hornet attack is under way, the board is unfolded to reveal a highly sticky surface and is then baited with either ApiArmour (coming soon from Vita Bee Health) or with a single Asian hornet (the hornet can be caught by using the board like a sports racquet to swipe and stick a flying hornet). The sticky board is then placed carefully in the apiary in an elevated position, away from flying colonies and preferably under a raised cover that protects from the rain and keeps inquisitive birds away. A stone or other weight on top of the board prevents the trap from being blown away. 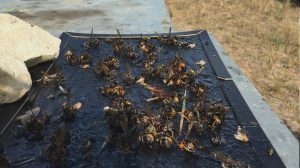 The ApiProtect trap should be inspected regularly and discarded and if necessary replaced when fully loaded with Asian hornets. The ApiProtect glue is non-toxic and odourless. The application of a suitable bait (such as an Asian hornet) will reduce the chances of by-catch. Since its first sighting near Bordeaux in in France in 2004, the Asian hornet has spread into every department of France and into surrounding countries causing great damage by predating on honey bees and other native pollinators. ApiProtect is suited to those areas that are under heavy predation pressure, currently much of France, northern Spain and coastal Portugal. Full details on ApiProtect and how to use it. Vita Bee Health is a mite control and honeybee health specialist. It is the world’s largest dedicated supplier of honeybee health products to the honey and pollination industries. With a rigorous and ethical approach to research and development into honeybee health, Vita has no commercial interests in crop pesticides or crop breeding that may be harmful to honeybees. Vita researches, develops, and manufactures a range of honeybee health products. Its headquarters are in the UK, it has offices in Italy, France and Russia, and partners across the globe. These products are marketed internationally through a network of 60 distributors in 50 countries. Vita’s honeybee health product range includes anti-varroa acaricides – Apistan® (outside the USA/Canada) and Apiguard® – chalkbrood and wax moth controls, foulbrood diagnostic kits and health-promoting feeds. Vita also supplies Asian hornet traps, Small Hive Beetle traps, a Bee Gym varroa grooming aid and swarm lures. Vita products have been registered by more than 60 veterinary authorities. Vita promotes sustainable beekeeping through Integrated Pest Management (IPM). Its treatments are designed to inhibit the build-up of resistance and wherever possible contain natural compounds and biological controls that are benign to all but the target pests. Vita invests a very high proportion of its turnover in research and development. Research partners include universities such as Thessaloniki, Cardiff, Milan, Udine and Naples and institutes such as the FERA Laboratories in the UK and the USDA in America. Vita’s innovative research and development work has been recognised by and has received support from the UK Government. As a result of its primary research of natural control agents, Vita is currently engaged in new projects exploring mite control in the agriculture, veterinary, and horticulture industries as well as public health and human allergen control. See www.vitabeehealth.com for more information and a web app which can be accessed at www.healthybeeguide.com. Follow Vita as “Vita Bee Health” on Facebook and as @vitabeehealth on Twitter. See www.vita-europe.com for more information and a web app which can be accessed at www.healthybeeguide.com.